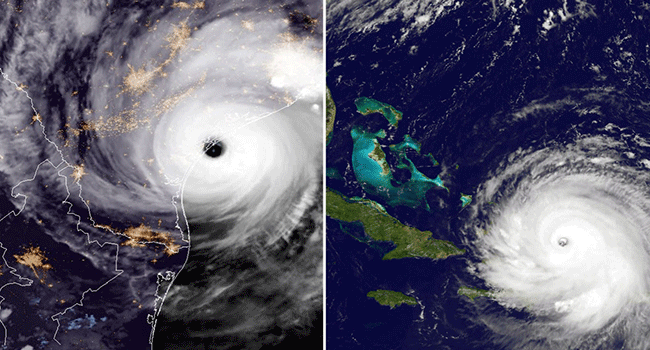 A damage survey from Hurricane Harvey in Texas and Hurricane Irma in Florida was done in September 2017. 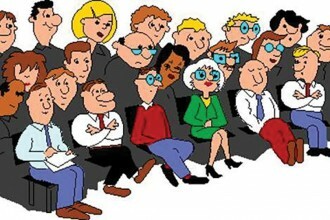 Below are some pictures and picture explanations. The hive damage was severe in Texas mostly for permanent beekeepers along the coast. There was severe damage on the southwest Florida peninsula below Tampa where Irma made landfall. The heavy rain caused by Harvey stalling in Texas was severe. Irma moved up the Florida peninsula and dissipated strength. Harvey attained Category four intensity overnight from August 24–25, 2017. Hours later, Harvey made landfall near Rockport, Texas, at peak intensity. Afterwards, rapid weakening ensued, and Harvey had degraded to a tropical storm as it stalled near the coastline of the state, dropping torrential and unprecedented amounts of rainfall over the Lone Star state. 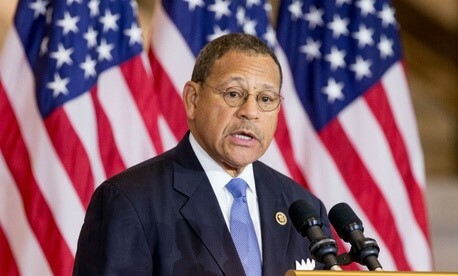 In a four-day period, many areas received more than 40 inches (100 cm) of rain as the system meandered over eastern Texas and adjacent waters, causing catastrophic flooding. With peak accumulations of 51.88 in (131.8 cm), Harvey is the wettest tropical hurricane on record in the contiguous United States. The resulting floods inundated hundreds of thousands of homes, displaced more than 30,000 people, and prompted more than 17,000 rescues. I spoke with Mary Reed, one of the Texas Apiary Inspectors, on Wednesday, September 27, 2017. The majority migratory commercial beekeepers had not moved into Texas. Many of permanent Texas commercial beekeepers did sustain a lot of damage. However, they did not know the percent total permanent beekeepers sustaining damage. Steve Coplin, Located west end Galveston County mainland side. Steve had about 600 colonies which suffered an 80% to 90% loss; or about 500 colonies that did not make it. He runs double deeps with the water half way up the top deep in some places. Holes in the top covers for ventilation allowed some colonies to escape. The bottom brood chamber and brood got wet with the combs unsalvageable. The bees’ absconded and Small Hive Beetles have moved in and multiplied. Also, mold grew on the brood frames. He had to burn the brood frames. Some of the boxes, lids, and pallets were salvaged. Fifty-seven inches of rain fell with resulting five to six feet of water. Steve is 15 miles from Galveston Harbor and Houston area water drains through this area. 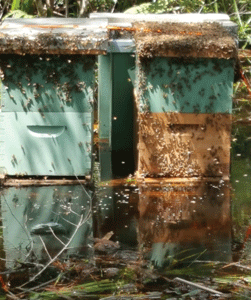 It was amazing, the water washed away 200-pound hives. His honey house and house were spared since they were built on higher ground. 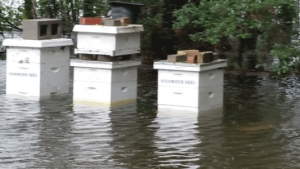 There are those of us that the water got so high the boxes simply floated away, bees and all. While others had nasty flood water enter the bottom brood boxes. Will those colonies survive? Will they rebound this time of year? It’s too soon to tell what the losses will be. Thankfully, most commercial beekeepers did not have all their colonies on the coast at the time Harvey hit. But there were a few, and they had some substantial losses. While the city of Houston received most of the flooding publicity, rainfall to the East of Houston in Liberty County, and South of Houston in Galveston and Brazoria Counties was greater. Colony loss generally corresponded with local rainfall totals with both Galveston County and Brazoria County beekeepers reporting losses just over 500 each. Included in these numbers are commercial beekeepers Steve Coplin and Steve Brackmann south of Houston who both lost hives in the hundreds, and sideliner Dane Bieto who lost nearly 70. Many more hobbyists lost hives, some of them total losses. Chris Moore beeyard and hives. A beekeeper Northwest of Houston, after losing hives to last year’s flood, planned ahead and built a raft to hold 18 hives. He had eight feet of water in his bee yard due to rising water from a nearby creek but all hives survived. 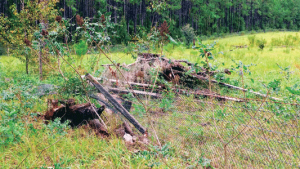 From Harrison Rogers, Brazoria County: The hive bottom boards on the nine hives in this yard are 20” off the ground. I got into the beeyard in a small boat and made upper entrances on the hives. One single weak hive was placed on top of another during the second day of rain which saved it. We lost three hives completely, all flooded in the bottom box of each. I saved five colonies by removing the bottom box from each hive after the water receded. Each of those boxes was infested with Small Hive Beetle and wax moths, but the bees had moved up in the hives and are doing well now. Irma developed on August 30, 2017 near the Cape Verde Islands, from a tropical wave. After dropping to Category three intensity due to land interaction, the storm re-intensified to Category four as it crossed warm waters between Cuba and Florida, before making landfall on Cudjoe Key with maximum sustained winds of 130 mph (215 km/h). Irma dropped back to Category three by the time it made a second Florida landfall on Marco Island. Irma weakened to a Category two hurricane later that day, the first time it weakened below major hurricane status in over a week, and eventually dissipated off the coast of New England. I received an email update on Friday, October 6, 2017 from David Westervelt. Florida lost approximately 7500 colonies which is between 1% and 1.5% of their bees. Most of these losses were from the Tampa area south, where Irma made landfall. 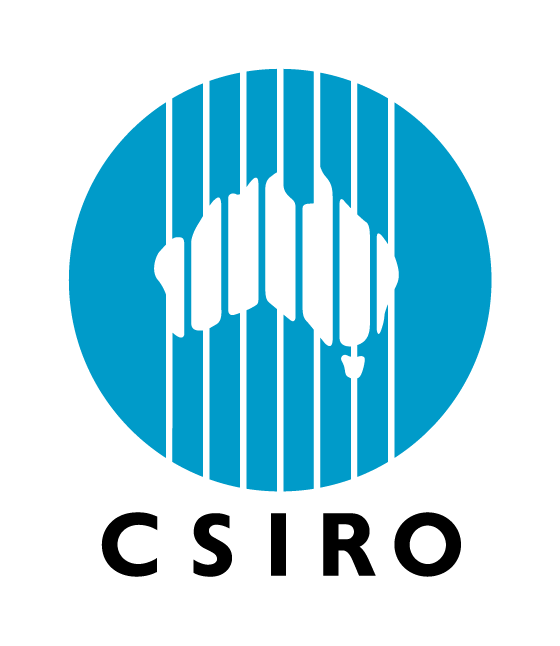 The Key’s suffered lost colonies. Most commercial operations had not yet moved into Florida when Irma made landfall. The Brazilian Pepper honey crop was mostly lost with Spanish Needle and Goldenrod producing some nectar. 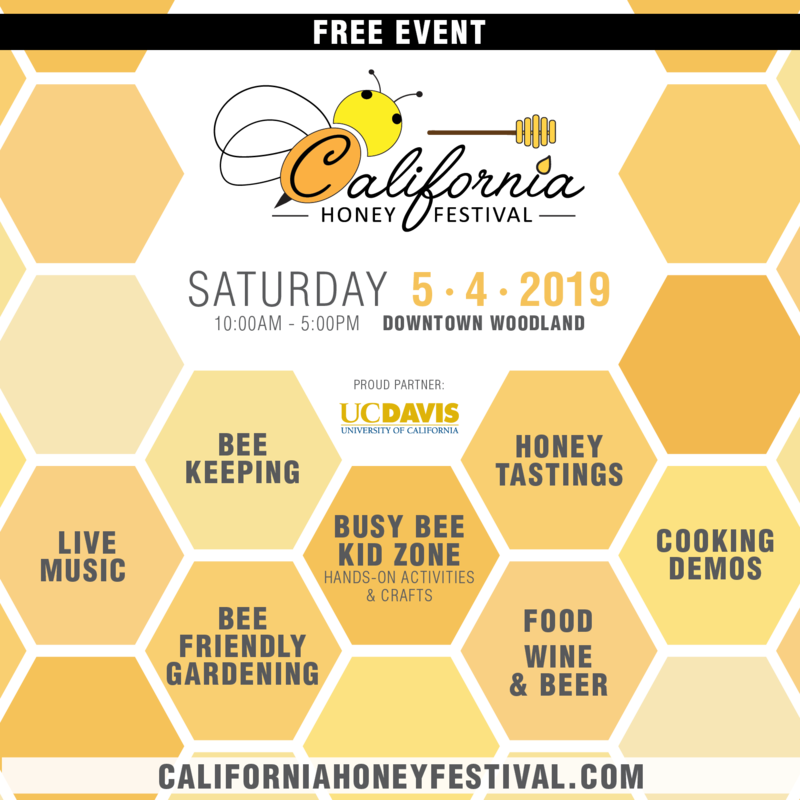 We have backyard hobbyist beekeepers’ members like myself and we also have members that are commercial beekeepers like Gs Dream Farms, John Gentzel, Lee Del Signore and South Florida Bee Supplies. They are all commercial beekeepers and members of the club. 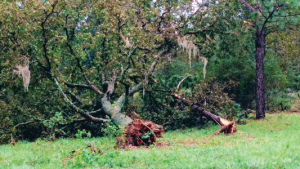 Wind damage, Gan Eden Farms, Inc., Live Oak, Florida. Personally, my bees did fine, I had them secure with tie ratchets and cement blocks. Fortunately, we did not get the eye of the hurricane but we did get hurricane cat 1 winds knocking down many trees and fences and power. It could have been much worse. At the club’s beeyard, we lost a colony because the beehive lid was blown away by the wind. The other hives are good. John and Kimberly, John’s daughter, lost more than 100 hives that were on Big Pine Key. Between John and Kimberly and their helper, they lost more than 300 hives. Their beeyard at Ft. Myers/Cape Coral they cannot get into yet. 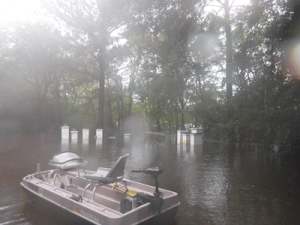 There was an extremely high storm surge that broke equipment and washed it away back into the woods. My situation is fine, I only have two honey bee colonies in my backyard in Belle Isle, FL near the Orlando International Airport. I put cement blocks on top of my hives & one had a downed limb on top of it which I removed this morning & the other was untouched. Neither one tipped over and the honey bees are active again today, despite high winds. Treasure Cove Beekeepers Association members are doing fine for the most part. We communicated with our members well in advance to allow them time to prepare their hives for IRMA. But still had some losses, but what I hear from most of my members is that they were successful in protecting their hives. I personally lost five hives and counting due to flooding. Our commercial beekeeper Jennifer Holmes from Hani Honey Company lost some hives, but I do not know how many. She was still counting when I communicated with her last week. 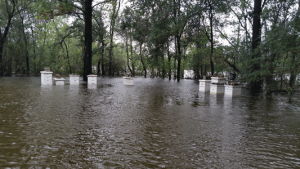 Treasure Cove Beekeepers – 1.5 feet of water over road. I have attached a couple of pictures of some of the hives that were damaged/lost. These hives were on cinder blocks and pallets and were still flooded. 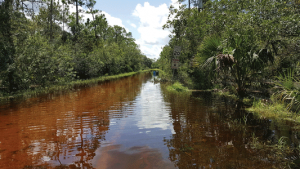 The road going to the bee yard was 1½ feet deep with water. Michael Harrell Was wading through water to get to hives and noticed an alligator following me. Michael Harrell – The hives are in town Grant/Valkaria which is two counties and about 40 miles north of Fort Pierce. After this devastating hurricane #maríapr, bees have run out of food and no home (if they are not in a apiary that has survived). Watch out there are no flowers to collect pollen and nectar. If there are no allergies at home, you can offer them (away from doors and windows) Honey, or fruit like the water melon, to feed them. David MacFawn keeps bees and analyzes the beekeeping industry from his home in Lexington, SC. He is the author of Beekeeping Tips and Techniques for the Southeast US and Beekeeping Finance published by Outskirts Press. 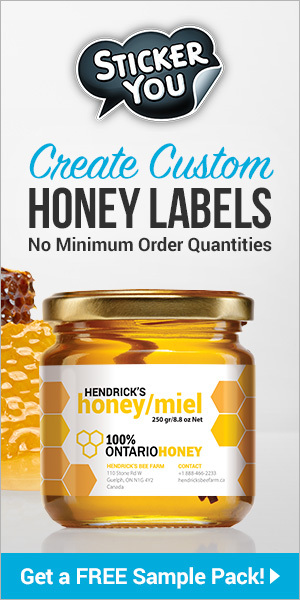 Next articleWinter Reading – Great Gifts For Any Beekeeper!